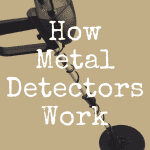 When you are new to using metal detectors, there are usually two main things you are searching for: coins and jewelry. While there are plenty of treasures waiting to be discovered, jewelry is one of the most lucrative targets. People are constantly losing their jewels, and sometimes, you can find them buried in beach sand, near the lake, or even at the park. Metal detectors can lead you to gold rings, silver watches, or diamond earrings. The potential is endless and jewelry finds are great for collectors as well as hunters that want to sell their treasure and make some money. 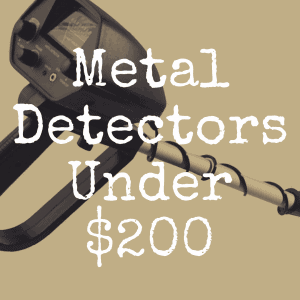 Before we move forward, take a brief moment to compare some of the best metal detectors for jewelry amongst one another based on price, weight, and key features. Why Should You Hunt for Jewelry? Where Should You Search for Jewelry? There are plenty of places where lost jewelry could be hiding. One of the best places to look is at the beach, where rings, necklaces, and bracelets are often hiding just beneath the surface of the sand. A lot of times beach goers don’t realize they’ve lost a ring in the surf or that an earring fell off while they were bending down to collect shells. Those little trinkets are left behind for you to discover when you take out your metal detector for a day of treasure hunting. Another good place to look is in old abandoned houses or storage areas. If there is an old ramshackle house on the edge of town, get permission to go check it out and use your metal detector to look for hidden jewelry. In some cases, you could find antique jewelry that dates back centuries. Historic and antique pieces are some of the most valuable. 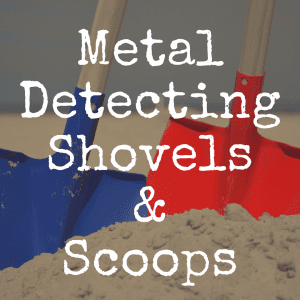 What Kind of Metal Detector Should You Choose? When you are hunting specifically for jewelry, there are some important features you will need in your detector. First, you will need excellent discrimination. 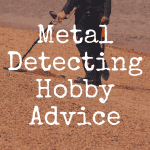 It’s common to discover lots of trash targets like old bottle caps or pieces of foil before you find any valuable jewelry, so you want your metal detector to have excellent discrimination so you aren’t getting faulty targets all the time. The best metal detector for jewelry will offer visual target ID and depth display as this can prevent you from wasting time digging up trash. Depending on where you are searching, ground mineralization might be a problem. It can interfere with your signal and make it difficult to distinguish when you actually find a real piece. Sometimes large jewelry will emit a different sound from your metal detector, so it really takes a lot of time and patience (and some needless digging) before you figure out the ropes and learn when to dig and when to keep moving. Before you start to hunt for jewelry, you need the right detector for the job. Here is a run down of the top five metal detectors that will help you find jewelry on your next search. 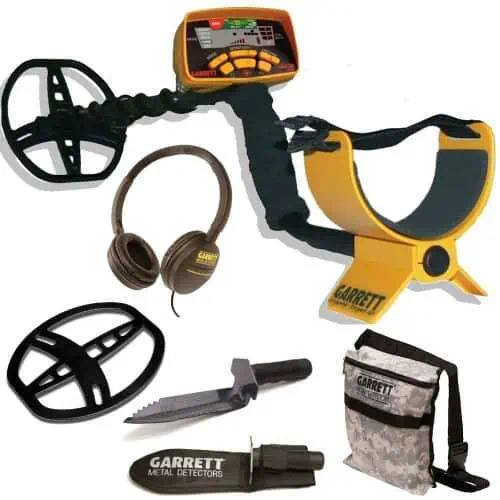 When you are looking for the best affordable metal detector to help you find some buried jewelry, the Bounty Hunter Legacy 2500 is a great option. This detector will work well at the park, the beach, or in an old abandoned home. It has enhanced target identification and expanded depth reading with all the important information easy to see on an oversized LCD display. The Legacy 2500 really works well in areas that are cluttered with trash and it discriminates well between a bottle cap and a gold ring, making your search for jewelry easier than ever. The Garrett Ace 350 is a winning choice for jewelry searches. It’s extremely user friendly and performs well even in areas with high mineralization. With enhanced iron resolution, it filters out a lot of junk so you can focus on finding a real treasure, like a gold bracelet or diamond earrings. It has five search modes and electronic pinpointing to precisely show you where the target is buried. As a plus, it comes with headphones and volume controls so it’s user friendly and comfortable. If you want a simple metal detector that is easy to use, opt for the Tesoro Compadre. This is a very user-friendly model with only one control knob and permanently connected coil. It’s so simple that a child could use it, but it’s still effective enough to help you find jewelry at the beach, the park, or the junkyard. The Compadre has excellent discrimination and while it won’t give you the depth field that some expensive models offer, it’s a good entry level metal detector for finding jewelry. If you want something with a little more precision and power, consider the Fisher F2 metal detector. This is an extremely sensitive detector with fast target response and a pinpoint numeric depth display. It comes equipped with visual target identification and a 4-tone audio ID, so you are sure to notice when you pass over a lost watch or bracelet. Best of all, it is lightweight and easy to carry for long distances at only 2.6 pounds. The top rated metal detector for finding jewelry is the XP Deus Wireless. This detector is one of a kind with wireless technology that makes the whole process of hunting streamlined and simple. It has three main components: a coil, a remote control, and audio headphones. All of the components link together over a digital signal so there are no more wires to worry about. The wireless signal gives you better signal acquisition so it’s extremely accurate. It’s also easy to store with a telescopic handle that can be packed away in the closet or under the bed without taking up too much space. This is a high-end option and it’s definitely the most expensive choice, but it’s well worth the money for the killer quality! Ultimately, any of these metal detectors would be a great choice for your next jewelry search. Whether you go for the entry level Tesoro Compadre or the more advanced XP Deus Wireless, you are sure to uncover some hidden jewelry on your next big search. 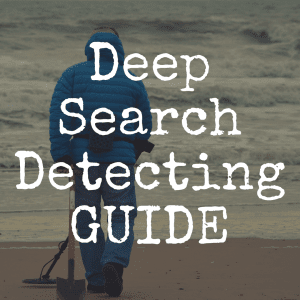 If you enjoyed this article, please “like” our brand new Discover Detecting Facebook page! 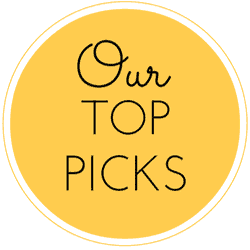 For more excellent and in-depth metal detecting reviews, be sure to bookmark Discover Detecting! 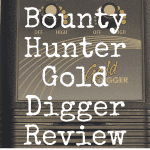 What’s the Best Metal Detector for Relic Hunting? What’s the Best Salt Water Metal Detector?